This week I was set to comment on “The Higher Calling of Higher Education—the first article in the Solutions section—when I realized that most of the articles in the Views section featured a variety of perspectives about the Brexit controversy and related global consequences. Since this is such a hot topic, I’ll highlight some of the issues involved. Some experts claim that the apparent widespread fragmentation of countries demonstrates an assault on global unification. The challenges associated with serious economic, social, political, and environmental concerns are motivating oppressed and disenfranchised people to express their deep dissatisfaction with globalization, a proclaimed manifestation of neoliberalism and its resultant detrimental economic policies. Neoliberalism refers to the resurgence of 19th-century laissez-faire economic liberalism. With the goal of reducing government’s economic role—by enhancing the private sector’s role—neoliberal advocates support extensive economic liberalization policies, including privatization, fiscal austerity, deregulation, free trade, and reductions in government spending. Sound familiar? In the U.S., most conservatives favor such policies, as well as many mainstream progressives. Ironically, left-wing “liberals” may be considered the principal objectors to neoliberal policies. Some experts are referring to the developing de-globalization phenomenon as an “age of disintegration”. One far-fetched yet genuine concern is any potential for a future breakup of the U.S. into separate countries. To wit: In recent years, ardent Texas patriots have grown bolder in calling for secession. And other southern states, where a majority of evangelical conservatives dwell, have significant constituencies who oppose any form of progressive legislative policies, especially when issued from a federal government controlled by progressives. If our nation’s growing socio-cultural-religious schism continues expanding, who knows what might happen in coming years. In a world that’s challenged with addressing serious issues—declining natural resources, widespread pollution of land, water, and air, extinction of species, climate change, and overpopulation—it’s no wonder that oppressed and impoverished people are getting desperate. Widespread wars, exacerbated by climate change (droughts, floods), and lack of sustainable resources, have led millions of refugees to flee their homelands for countries that increasingly don’t want to accept them. Tribalism is increasing, as frustrated, angry, irrational people—including working middle-class citizens in the U.S.—seek scapegoats, blaming anyone remotely responsible for causing their misfortunes. 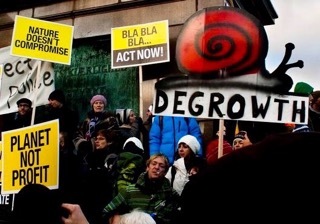 One major concept that most people don’t understand, much less endorse, is that of degrowth. They wonder why anyone wouldn’t want or expect every desirable thing to keep growing. Well, as many reputable authorities have pointed out, it’s a problem addressed simply, by applying basic principles of math and physics. It doesn’t take a rocket scientist to understand that on a finite planet, there has to be limits to material growth, as determined by limited natural resources (water, land, minerals, etc.) and the number of consumers. Obviously, the more consumers or population we have, the more demands made on natural resources. Thus, with declining natural resources, especially plentiful, cheap energy, this planet cannot possibly sustain a population of a projected 10 billion people by 2050, no matter how many technological marvels may be dreamed up by well intentioned techno-fixers. However, on the good-news side, there may not be any limits to qualitative growth, as related to the life-affirming values that instill intellectual, moral, and esthetic growth in the development of responsible, caring citizens. Because we urgently need to take constructive action in averting—or at least mitigating—some major common crises, it’s past time for thoughtful people to reevaluate the concept of constant material growth. Spawned in the late 18th century with the introduction of fossil fuels, this unrealistic growth mantra has run its course. We cannot continue thinking irrationally, and performing the same detrimental behaviors of over-working, over-consuming, over-blaming, and over-populating. I hope you agree that there’s a better way, one that may require humanity to adopt a more frugal, simple path, but one that is also more humane, more meaningful, and ultimately more fulfilling. Creating a more resilient and sustainable earth for future world citizens will require discarding our dedication to the god of material growth, and focusing instead on seeking a qualitative existence for all living things. > Common Dreams: Brexit and the New Global Rebellion (Richard Eskow). Things are changing. A major crack has appeared in the edifice of globalization, and the neoliberal order that has dominated the world’s economy since the end of World War II is now in danger. That’s not necessarily a bad thing, by any means. We now know that Great Britain, itself an amalgam of older nations, is divided. England and Wales voted to leave Europe, while Scotland, Northern Ireland, and ethnically diverse London voted to remain. The world’s financial and political elites must now face the fact that resistance to their economic order, which has shaped the world since the Bretton Woods conference of 1944, is a major phenomenon. These elites are apparently more out of touch with the citizens of the industrialized world than at any time in modern memory. The current order is unstable. The uprising has begun. But who will lead it? > Counter Currents; The Age Of Disintegration: Neoliberalism, Interventionism, The Resource Curse, And A Fragmenting World (Patrick Cockburn). We live in an age of disintegration, as illustrated in the Greater Middle East and Africa. Between Pakistan and Nigeria, there are at least seven ongoing destructive wars—in Afghanistan, Iraq, Syria, Yemen, Libya, Somalia, and South Sudan, and it is doubtful they will ever recover. All of these have a number of things in common: they are endless and seem never to produce definitive winners or losers. In the process and under the pressure of outside military intervention, a vast region of the planet seems to be cracking open. Yet there is very little understanding of these processes in Washington. Though there are clearly many reasons for the present disintegration of states and they differ somewhat from place to place, one thing is beyond question: the phenomenon itself is becoming the norm across vast reaches of the planet. > Resilience: Degrowth By Designed Disaster? (Lass Thiele). Technically speaking, degrowth commonly refers to GDP degrowth, the reduction of total monetized exchange within a given (national) economy with hopefully ecologically beneficial results. This is a quantitative view of degrowth. More abstractly, degrowth presents a socially transformative vision – one that envisions qualitative change. Degrowth thus aims at a “good life” for all and certainly not at more misery under capitalism. Neoliberalism, by contrast, is all about marketization and pure economism, based on an understanding of all human interactions as motivated by individual utility maximization. For good reasons, the degrowth movement should remain wary of any association with austerity politics. > Transition Voice: Breaking The System: Activists, Be Careful What You Wish For (Erik Curren). The three-century-long reign of the market economy is nearing its end whether we like it or not, wrote late British economist David Fleming in Surviving the Future: Culture, Carnival and Capital in the Aftermath of the Market Economy. For Fleming, who wrote about peak oil and the environment and shared the Transition movement’s vision of a lower-energy economy based in local communities, the end of global industrialism is certainly a cause for celebration. But for Fleming, the twilight of the market economy is also an occasion for sadness. We don’t exactly know what tomorrow will look like. So people who want to prepare for climate change and peak energy are probably safest supporting anything that uses less stuff and costs less money while bringing us closer to people in the communities where we live. > Inequality: America’s Working Poor (Chuck Collins). Few Rewards, co-authored by Oxfam America and the Economic Policy Institute, dramatizes the struggles of low-wage workers and provides a precise analysis of who these workers are and where they live. Almost half of U.S. workers earn under $15 an hour, including 53 percent of African American workers and 60 percent of Hispanic workers. One in three workers earns less than $12 an hour, according to the report. Women are the majority of low-wage workers. Over 55 percent of women workers earn under $12 an hour. Low-wage workers are most concentrated in rural states. The states with the highest percentage of low-wage workers by rank are Arkansas, Idaho, New Mexico, Mississippi, Montana, South Carolina, and Alabama. The report is accompanied by an interactive website that illustrates state-by-state profiles, maps that show concentrations of low-wage populations, and information by race and gender. > Resilience: Energy And Justice (Richard Heinberg, David Fridley; Chapter 8 of Our Renewable Future; and Carbon Institute’s companion website, ourrenewablefuture.org). One school of thought says that increased rates of energy flowing through society actually create inequality. The recorded societies whose members have enjoyed the highest levels of economic equity are hunter-gatherer bands, in which individuals own little and share everything. These are also the societies with the lowest levels of energy consumption. As societies developed agriculture and then industry, full-time division of labor and the use of powered machines to generate wealth led reliably to the emergence of ruling and merchant classes, alongside large numbers of displaced landless peasants and economic refugees who were actually worse off, in many ways, than hunter-gatherers. Looking ahead, decentralized energy democracy could be a significant driver of equity, especially in mid-sized towns and cities. > Resilience: Oil, Interest Rates And Debt (Rune Likvern). At first glance it is hard to see how oil, interest rates and debt are connected. Two of them are human constructs while oil (fossil sunlight), Mother Nature’s gift of oil took tens of millions of years to process. An endowment extracted from a confined underground stock, oil is now the most dense and versatile known energy source. What is now playing out in the oil market may be described in these steps: low interest rates stimulate debt growth, causing demand to be pushed forward and creating an oversupply, which results in deflation. In contrast, higher interest rates will have serious implications for highly leveraged consumers and oil companies, according to these dynamic steps: higher interest rates lower demand, placing downward pressure on price [deflation], and making it harder for highly leveraged consumers (oil companies) to service their debt overhang, which lowers investments and helps develop costlier supplies. > Resource Insights: Brexit And The Energy Equation (Kurt Cobb). A major question is why there is building discontent with global economic and political integration not only in Europe, but also in the United States. The slim defeat for pro-EU forces has been explained as a vote against EU immigration and business regulation policies and against the loss of national sovereignty. But there is also a feeling afoot that the move toward greater integration through the EU and through global and regional trade agreements is designed primarily to enrich global financial elites—all the while subjecting middle and lower-class wage earners to stagnant and even falling incomes as they compete against cheap labor in developing countries. In the conversation about the rising revulsion against further integration, one factor is not being discussed: energy. > Think Progress: 31 Science Groups To Congress: Stop Denying And Start Fighting Climate Change (Joe Romm). Yes, this is the umpteenth report from scientists—see, for instance, “Climate Scientists: We’re Alarmed. Here’s Why You Should Be, Too” and “IPCC Scientists Emphasize Immorality Of Inaction By Focusing On ‘Irreversible Impacts. But as long as the media still gives major politicians a free pass on this most preventable of existential threats to America, scientists will have to keep “reminding” policymakers of the broad scientific understanding about human-caused climate change. Now the broad negative impacts are here, just as the scientific community predicted. “For the United States, climate change impacts include greater threats of extreme weather events, sea level rise, and increased risk of regional water scarcity, heat waves, wildfires, and the disturbance of biological systems.” The good news is that it’s not too late for serious action to yield enormous benefits. > Yes! Magazine: In New York, Republicans And Democrats Join Forces To Overturn Citizens United (Lynsi Burton). A bipartisan majority of New York’s Senate and Assembly issued letters to Congress on June 15 calling for a 28th amendment. Both Republican and Democratic versions of the letter demand the new amendment say that corporations “are not entitled to the same rights and protections as natural persons under the Constitution,” which moves the country toward overturning the Supreme Court’s 2010 decision in Citizens United. Nationwide, 80 percent of Republicans and 83 percent of Democrats oppose Citizens United, according to a 2015 Bloomberg poll. > Desmog: Obama Admin Approved Over 1,500 Offshore Fracking Permits In Gulf Of Mexico (Steve Horn). On June 24, the independent news website TruthOut broke a doozy of a story: the Obama Administration has secretly approved over 1,500 instances of offshore hydraulic fracturing (“fracking”) in the Gulf of Mexico, including during the Deepwater Horizon offshore spill disaster. Albeit released on a Friday, a day where many mainstream-media reporters head out of the office early and venture to late-afternoon and early-evening Happy Hour specials at the bars, the TruthOut story has received deafening silence by the corporate-owned media apparatus. > The Guardian: How Your Clothes Are Poisoning Our Oceans And Food Supply (Leah Messinger). New studies indicate that the fibers in our clothes could be poisoning our waterways and food chain on a massive scale. Microfibers—tiny threads shed from fabric—have been found in abundance on shorelines where wastewater is released. Now researchers are trying to pinpoint where these plastic fibers are coming from. In an alarming study released Monday, researchers at the University of California at Santa Barbara found that, on average, synthetic fleece jackets release 1.7 grams of microfibers each wash. It also found that older jackets shed almost twice as many fibers as new jackets. These microfibers then travel to your local wastewater-treatment plant, where up to 40% of them enter rivers, lakes and oceans. > Common Dreams: As World Burns, Richest Nations Can’t Decide When To End Fossil Fuel Handouts (Nadia Prupis). The world’s richest nations have failed to agree on a deadline to phase out fossil fuels subsidies—a commitment energy ministers made in 2009. Energy ministers from the Group of 20 (G20) met in Beijing on Wednesday and Thursday to discuss bringing those subsidies to a close after the Group of 7 (G7), the world’s seven wealthiest economies, last month committed to eliminate “inefficient” fossil fuel handouts by 2025. A report published in 2015 by the climate group Oil Change International found that the combined G20 subsidies for oil, gas, and coal production amounts to roughly $444 billion a year. But despite ambitious pledges during the COP21 summit in Paris last year and long-term campaigning from climate groups, who urged an even earlier phase-out deadline of 2020, officials could not agree on a target date. > Climate Progress: Just Five Common Foods Produce More Greenhouse Gas Emissions Than Most Countries (Natasha Geiling). As some of the most common commodity crops in the world—wheat, soy, corn, rice, or palm oil—it’s likely that your last meal contained at least one of these ingredients, even if you weren’t aware of it. Palm oil can hide in things like sandwich bread or pizza dough, while soy can find its way into everything from cereal to canned soups. That means that, knowingly or not, your last meal probably helped contribute to the greenhouse gas pollution that is driving global climate change. According to a new report from Oxfam America, the production of these five commodity crops emits more greenhouse gases annually than each of the world’s countries, save for the United States and China. A lot of those emissions occur on the farm, released from eroded soil or overgenerous amounts of fertilizer. > Grist: Congress Fails To Pass Zika Bill, And That’s An Ominous Sign Of Things To Come (Ben Adler). The Zika virus epidemic in Latin America and the Caribbean threatens to spread throughout much of the United States, causing birth defects and potentially deadly or paralyzing complications, but Congress is failing in doing anything about it. With climate change increasing the prevalence of mosquito-borne illnesses such as Zika, this is a chilling reminder of how political dysfunction may prevent timely responses to climate-related disasters. The House passed a $1.1 billion bill to fight Zika last week, and on Tuesday, the Senate voted 52 to 48 in favor of the same measure. But it now takes 60 votes to pass anything in the Senate, thanks to rampant filibuster abuse, so 52 votes is not enough. Strangely, Senate Democrats were the ones who voted the bill down, because House and Senate Republicans stuffed the bill with a conservative wish list unconnected to Zika. > Think Progress: El Niño And Climate Change Are Making The Amazon Dry And Flammable (Alejandro Davila Fragoso). The Amazon could be facing fire risks in the coming dry months greater than those experienced in the last 14 years due to the long lasting effects of El Niño, according to the Amazon fire forecast unveiled by NASA and the University of California, Irvine, Wednesday. Drought in the world’s largest rainforest seems like a contradiction in terms, but what were once considered once-in-a-century events are increasing as global warming takes hold. Just in the past decade, the Amazon suffered from two record drought years in 2005 and 2010, as well as massive fires thought to have been mostly caused by humans. This year’s projections come at a sensitive time for the Amazon, as the region has dealt with a series of oil spills, as well as overwhelming mining pollution in Peru, the country with the second largest portion of Amazon rainforest. > Scientific American: Antarctic Ozone Hole Is On The Mend (Alexander Witze). It’s the beginning of the end for the Antarctic ozone hole. A new analysis shows that, on average, the hole—which forms every Southern Hemisphere spring, letting in dangerous ultraviolet light—is smaller and appears later in the year than it did in 2000. The 1987 global treaty called the Montreal Protocol sought to reduce the ozone hole by banning chlorofluorocarbons, chlorine-containing chemicals—used as refrigerants in products such as air conditioners—that accelerated ozone loss in the stratosphere. The study shows that it worked. A 2014 assessment by the World Meteorological Organization found that healing had begun at high elevations in mid- and low latitudes. It will take many decades for the hole to heal completely. > Great Transition Initiative: A Higher Calling For Higher Education (Cristina Escrigas). Universities play a key part in shaping civilization and thus bear a significant intergenerational responsibility. They are responsible for providing students with knowledge of the past while preparing them to be critical, open-minded, and creative contributors to contemporary society. The higher purpose of higher education is to go beyond helping students to develop the skills necessary to earn a livelihood, to facilitating ethical awareness, fostering critically engaged citizens, and imbuing all professions with a sense of the common good. Integral to this new way of thinking must be a revised concept of progress that goes beyond the post-industrial and neoliberal status quo. We are moving from a world of certainty to a world of uncertainty, for which we are neither prepared nor equipped to handle. > Midwestern Energy News: Teen Activism Moves Minneapolis Suburb To Pass Climate Initiative (Frank Jossi). Officials in a Minneapolis suburb adopted an aggressive greenhouse-gas-reduction policy last month that was brought forth by a group of local high school students who are part of a national climate change movement. Drafted by iMatter, a national youth-led group, the resolution aims for net-zero emissions by 2040 in St. Louis Park, a suburb immediately west of Minneapolis with a population of roughly 47,000. The resolution also commits the city to working with youth activists on its future goals and planning. The students were the first in the country to have a resolution passed that was prepared by iMatter, which is training high school students across the nation to lobby their communities to pass a “Climate Inheritance Resolution.” The group’s website says similar efforts are underway in cities in New York, Iowa, Illinois, California and Canada. > Climate Progress: This 21-Year-Old May Have Found The Way To Clean Up The Plastic In Our Oceans (Alejandro Davila Fragoso). Boyan Slat was just 16 when he realized he wanted to rid the oceans of plastic. It all happened after he dove into the problem in the most literal way while snorkeling in Greece and finding more drifting plastic than fish swimming. Indeed, the problem is real and large. Around eight million metric tons of plastic waste enters the oceans every year, according to a 2015 study. In addition, recent research found so-called garbage patches in every major ocean. Plastic is so pervasive that it’s been found in sea ice, and also inside 50 percent of all species of seabirds, 66 percent of all species of marine mammals, and all species of sea turtles. Slat, chief executive officer of The Ocean Clean Up, has taken his eureka moment and turned it into a collection system based on floating barriers attached to the sea bed that use the ocean’s energy to gather plastic waste. > Midwest Energy News: Q&A: Minnesota Companies Create ‘Circular Economy’ Coalition (Frank Jossi). More than 25 Minnesota businesses, which include the state’s largest employers, have come together on a strategy for creating a “circular economy” to eliminate waste and rely on renewable energy. The Minnesota Sustainable Growth Coalition will be led by the Environmental Initiative. The members include many familiar names with local and international reach—3M, Andersen Corp., Aveda, Best Buy, Cargill, General Mills, Hormel Foods, Target and Xcel Energy, to name a few. The basic premise is reusing materials and promoting renewable energy—a waste-not-want-not approach to the manufacturing and disposal of goods. Businesses are interested in a circular economy because of natural-resource limitations. > Alternet: Buying Local Is The Key To Strong Regional Economies (Susan Witt). In the leaky bucket analogy for local economies, money flows into a region to circulate through local businesses like water into a bucket. Water that leaks out is money that escapes the local economy to pay for imports. The more watertight the bucket, the more wealth is retained. Spurred by a growing appreciation for local food, citizens, businesses, non-profits, and governmental organizations have begun to work together to build regional food systems. But what else might be sourced locally? What can citizens do to thwart the leaky bucket syndrome of their own local economies? > Defend Our Future: 6 Ways Living Green Will Save You Money (Jordyn Cormier). What many people don’t realize, however, is just how affordable living green can be. Here are 6 sustainable habits that help you to save money and stay healthy while still making a huge impact on environmental health: 1) buy fewer packaged foods; 2) eat less meat; 3) recycle old phones; 4) carry a water canteen; 5) shop secondhand; and 6) walk and bike more. Living green isn’t difficult. It doesn’t require a surplus of cash or a complete lifestyle overhaul. It simply requires a little bit of extra mindfulness. > Strong Towns: The Emerging Democratized Economy (Alexander Dukes). A “Democratized Economy” is an economy that looks to the talent and wisdom of the population at large to drive the economy. The Democratized Economy does not see the public merely as “consumers-” to whom a few industrial titans sell products, but rather as a resource from which new ideas and products emerge spontaneously. It is defined by a more inclusive culture of production that pulls us back to regional economies based on locally crafted products that are specialized to serve niches that the Modernist Economy ignores. Towns and cities should move away from depending on one or two massive employers in a national industry, and, instead, focus on developing several smaller employers in a variety of industries to serve their respective region, by supporting their own local entrepreneurs to build their economy from the bottom up. > CERT: New Educational Guide: Solar Electricity For The Home, Farm, And Business. The Clean Energy Resource Teams (CERTs) adapted a popular series of guides for Minnesota audiences, and they’re now available for download in pdf format.